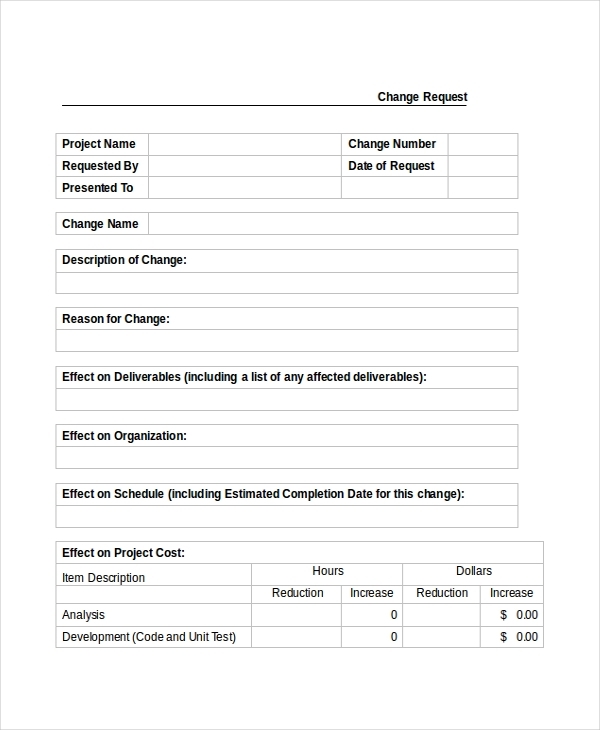 A construction change order request form is a type of a form which is used to address unforeseen possibilities that can crop up and replaces the original contract for the construction project. Henceforth, this particular form is used to notify the various changes that are to be made in the construction contract. There can be various changes like extending the deadline of the contract, change in the price of the materials from the suppliers etc. 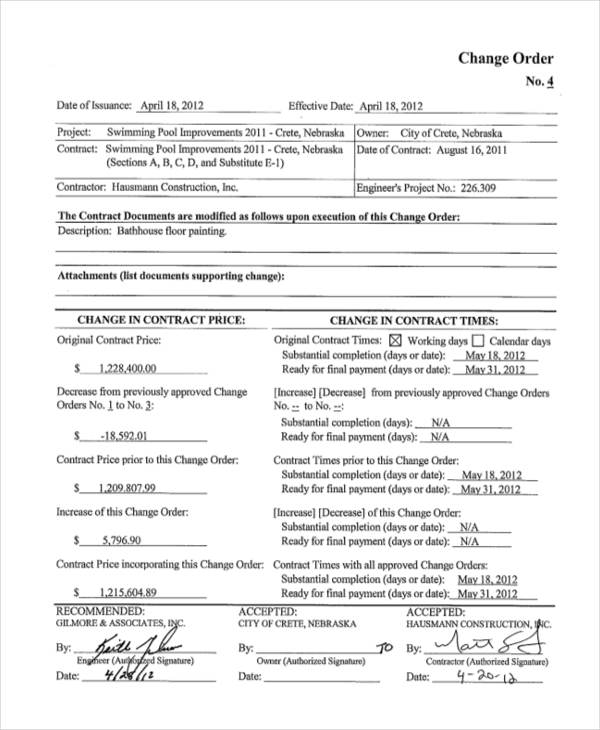 This form is a legal document for the changes made in a contract. It is a type of a form which is used in changing items that are brought. The buyer mainly uses this particular form to change the items that he or she has already purchased. The form has certain details to be filled up like the name of the supplier, information about the buyer, information about the changes that are to be made with proper reasons and at the end a description of the change request, along with the identity of the requestor. This form is mainly used to change the purchase order. Any purchase which needs to be changed can be done with the assistance of this particular form. The form contains various detailed information like item no., price, quantity, description etc. Some supporting documents need to be attached with this form in order to successfully change the order. 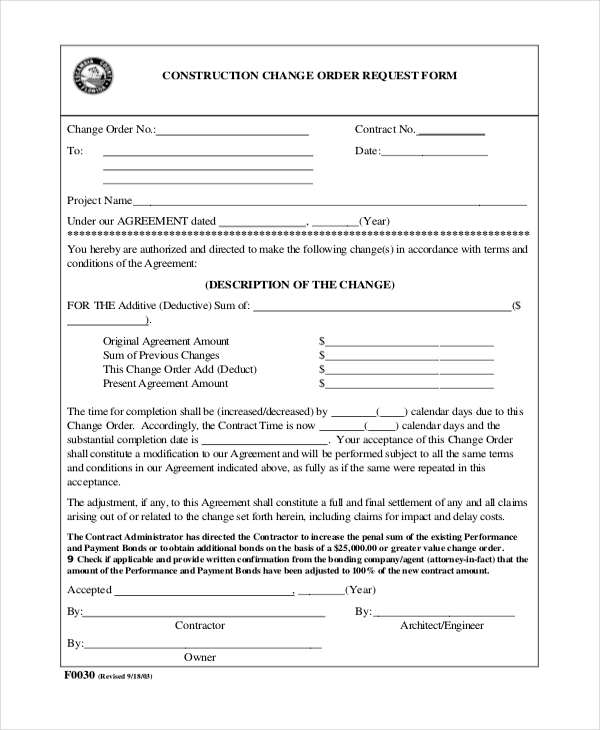 This is a type of a form which is completed by the homeowner and contractor to authorize changes to the original contract. The form contains every type of changes that is needed in remodeling or renovations of the property. This is a type of a form which will notify the changes that are needed to be made in the swimming pool. The information in this particular form will determine if the equipment will meet the requirements of the swimming pool or not. This is a type of a document which acts as the final proof of the change in order to take place. This particular document needs to be signed by the authorities who have been given the charge to do it. This document finalizes the change which needs to be brought. 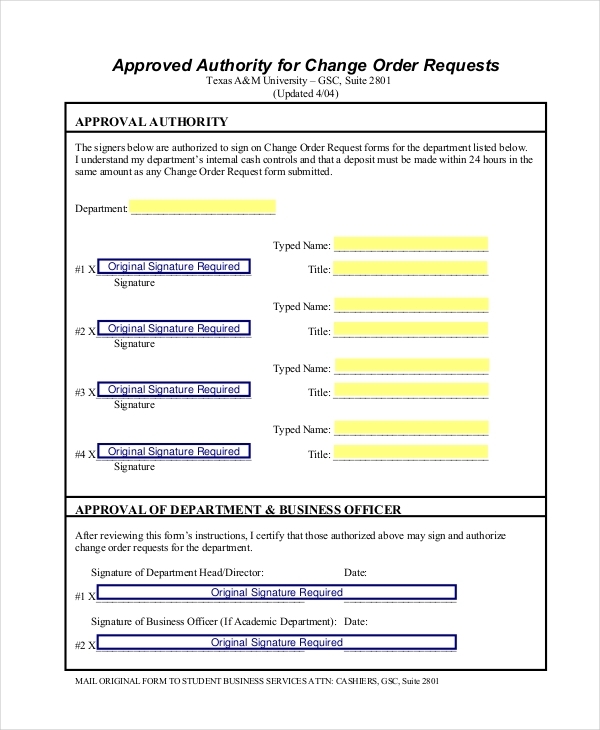 The project change order request form is used to get approval for a significant business. This form helps in approval of changes, made in the original project plan in both technical and financial platform. The form needs to be supported by various documents in order to get approved. This is a type of a form which is used to bring a change in the financial platform. Any type of change that needs to be made in the financial part of any organization is done with the help of this particular form. 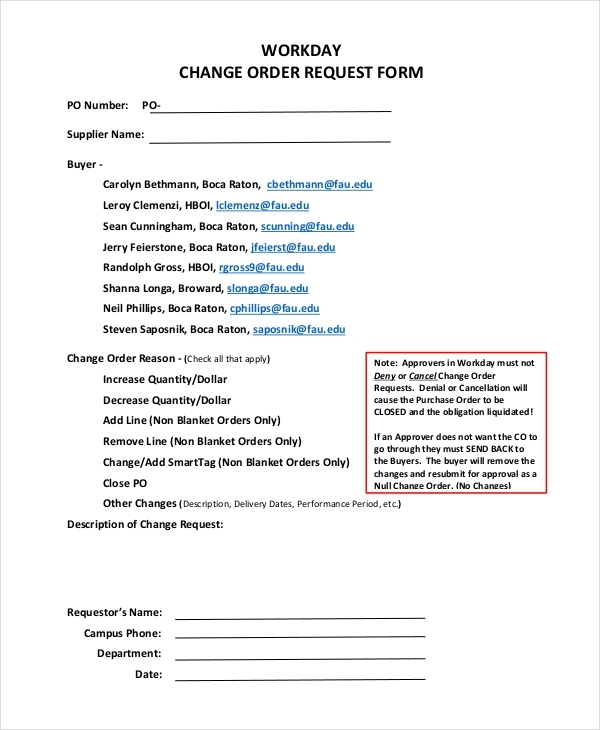 What is a Change Order Request Form? The form helps in an easy change of the products and services. This form serves every purpose of change in various products in any industry. This form is also beneficial for a requisition for change. This is the easiest method to approach for a change. It is considered to be a legal document, where the changes which are needed can be written and with the support of various other documents the change gets authorized. A change order request form is useful in every kind of industry. Every industry approves this particular form to bring changes for different elements. 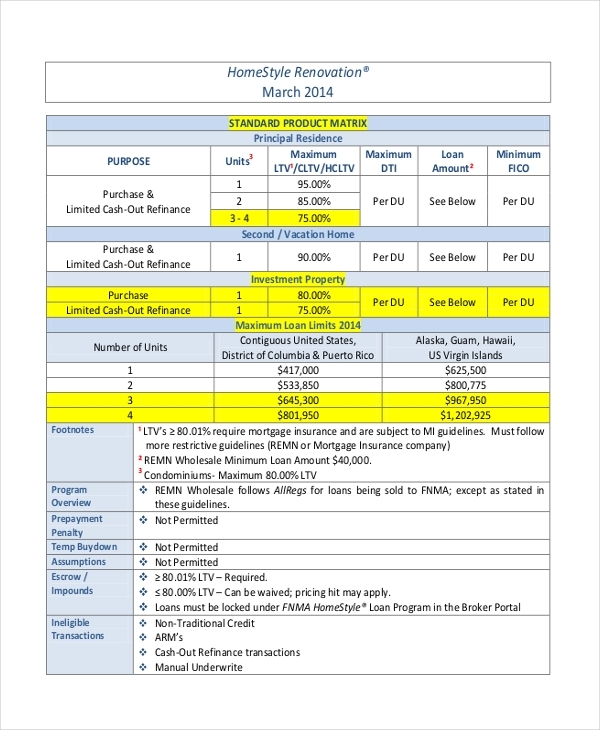 This particular form is beneficial for both the buyers and the sellers. This particular form has a huge base of the target audience. Let’s figure out the various types of the target audience. Buyer- A buyer, if need to change a particular item which has already been purchased can avail this particular form in order to make the change. Social organization- Any social organization which is working for the welfare can also take the help of this form. This form is also used as a requisition form. The various social organizations can fill up the changes in this particular form that needs to be done in any welfare work. 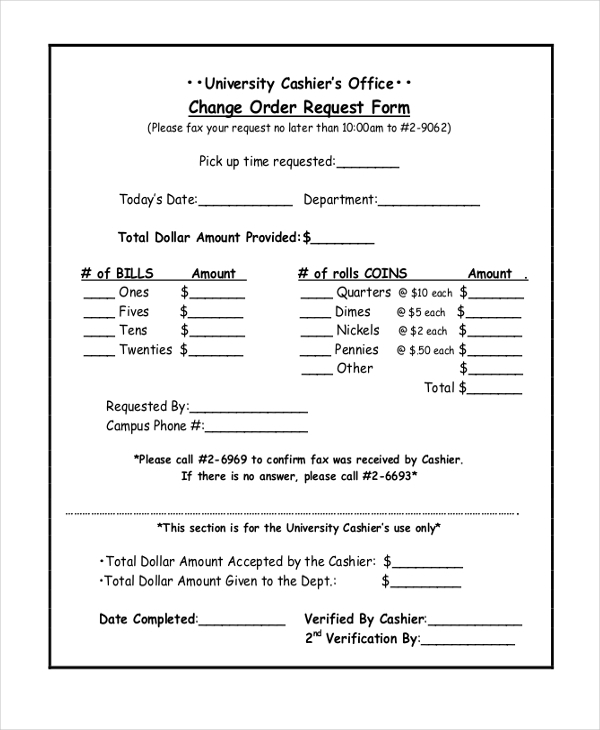 A change order request form is used for various different purposes. Any kind of change or requisition can be done with the help of this particular form. Every kind of industry uses this form in order to bring about a change in any product or services. This form is a kind of a legal document which, after being approved can be processed for the change. Not only in the industrial sector but the domestic sector can also avail this particular form for bringing change over any goods which are already purchased. A change order request is a form which can be served for various purposes. The usage of this form is vital and has a great importance. The form can be used for various diversified purposes. It is believed that after the purchase, various situations arise where a change is required. 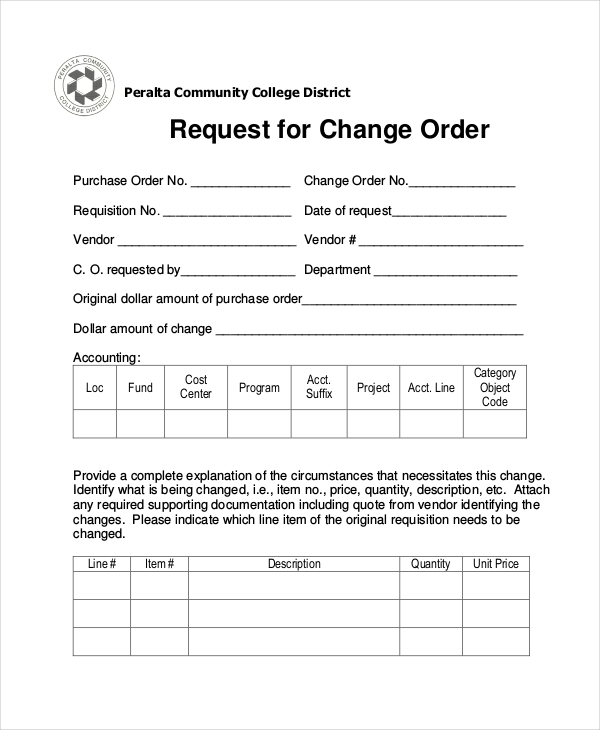 A particular change can only be processed with the help of a change order request form. This form highlights each and every detail of the product and also it adds a description of why the change is necessary. At the end, this form is supported by various documents like bills and receipts for the exchange or change to take place. The process of requisition also can be achieved with the help of this particular form. In short, it can be said that it is one of the most vital and important legal document which can be used for bringing a change over any goods or services.